Having burned my hands through the disposable cups of our coffee culture, I devised a solution that allows the coffee-drinker to divorce themselves from having to actually hold their hot coffee with their hands. The slingshot. 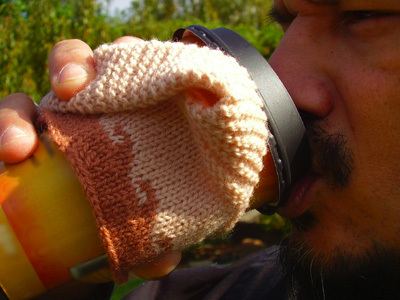 Slingshot will keep your hands away from scalding liquid, while allowing you to carry the coffee without spilling. 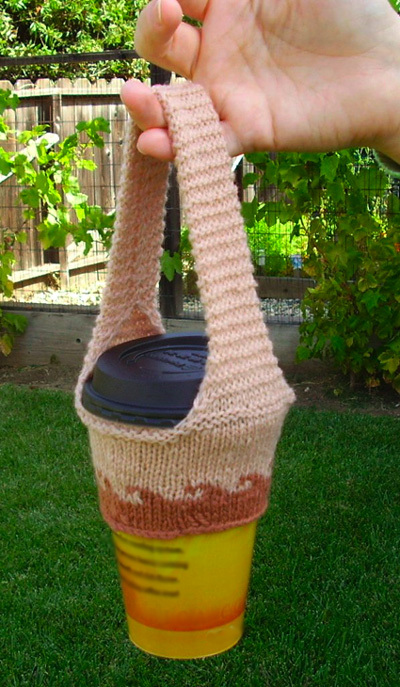 Just slip the cup into the lower part of the carrier and off you go. One can even drink with the cup still in Slingshot...just move the handle aside to sip through the coffee lid. A little bit of Fair Isle makes it stretch into a bit more knitting and provides an opportunity to try out Fair Isle without the commitment of a sweater or socks or whatever. If you don't want fair isle, work even in one color. The pattern calls for 1 ball in two colors, but you will not use anything near the entire ball, and could get multiple Slingshots out of the materials as listed. Using waste yarn, work a crochet chain several sts longer than the number of sts to be cast on. Starting 1 or 2 sts in from end of chain and using working yarn, pick up and k 1 st in the back loop of each ch until the required number of sts have been worked. Later, the chain will be unraveled and the resulting live sts picked up. Instructions for Cable Cast On can be found here. Using MC and Crochet Cast On (or other provisional cast on method), CO 18 sts. Work in garter st until work measures 8.5 inches. Next Row: K all sts, CO 14 sts using Cable Cast On; remove crochet chain from CO edge, ensure that handle is not twisted and place resulting 18 live sts on spare needle, k these sts; CO 14 sts using Cable Cast On. 62 sts. Distribute sts evenly between needles, place marker and join to begin working in the round, being careful not to twist. Next Round: [K29, k2tog] twice. 60 sts. (chart is repeated 10 times in each round). K 6 rounds using CC. Last Round: [K13, k2tog] four times. 56 sts. Beginning approx. 1 inch from base of handle at each end, fold handle lengthwise, so that long edges meet (see photo at top). Sew edges together. Kelley taught herself to knit in 2002 upon seeing great sweaters in a knitting magazine that shall remain nameless. Today, she knits between working, spinning, mothering two small children and whatever else comes up.